I've been an avid reader for as long as I can remember. When I was growing up, I spent my babysitting money on the latest Sweet Valley Twins or Babysitters Club novel, and was always a member of the rewards program at Waldenbooks. I could often be found with a flashlight under the covers reading past my bedtime, and I always had a book in my locker at school in case I had a few extra minutes to read in class. Nowadays, I can't say that I read as much as I used to, but I never miss a chance to catch up on the latest Nicholas Sparks novel. Grace and I love to read Pete the Cat together. When I got pregnant with Grace, I knew that reading would be one of our favorite activities to do together. I was thrilled by all the books she got at the baby shower, and started reading to her the day she came home from the hospital. I think the first book I read to her was a St. Louis Cardinals book from my Grandpa Phil. I can say that in the last four and a half years, her book collection has grown and grown and grown. 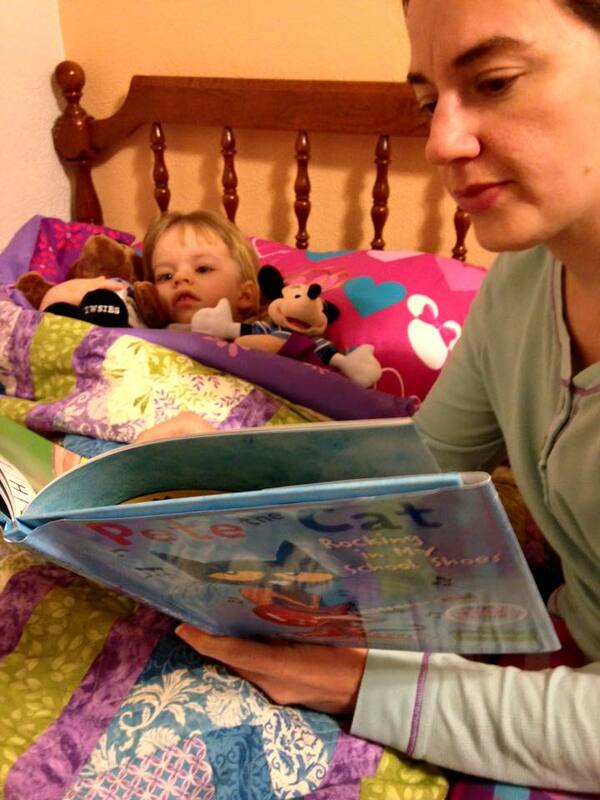 From Disney to Dr. Seuss, we read just about every single night. This year for Christmas, Grace got an illustrated version of the first Harry Potter book, which is one of my favorites, and we have been reading it together as a family. As we were reading one night, it dawned on me just how good some of her books really are. So, this year, as I write my columns, I've decided to share life lessons from some of our favorite storybook characters. And I hope you enjoy it as much as I do. A few years ago, Kyle's Aunt Karen, introduced us to Pete the Cat. And our lives have never been the same. Karen is an elementary school librarian in the St. Louis area, and has shared many of her favorite characters with us. But it didn't take long for Pete the Cat to become one of our favorites as well. Pete is seemingly a regular cat, although he is blue in color. He rides the bus, goes to school and just has a great attitude about life. Our first book, Pete the Cat: I Love My White Shoes, was actually the first of the children's books to be published by James Dean. It even came with a CD, so I could sing along with the catchy tune. In the story, Pete loves his brand new white shoes, but along his journey, he steps in strawberries, blueberries and mud, turning his brand new shoes a variety of colors. But Pete keeps singing about how much he loves his shoes whatever color they become. And in the end, Pete says "it doesn't matter what you step in, keep walking along and singing your song, because it's all good." That was a good take-home lesson for me. Some days, it's tough to get up and face whatever lies in front of my day. Whether it's a deadline at work or a doctor's appointment for Grace in St. Louis, I just keep putting one foot in front of the other, because it's all good on this "Grace-Filled Journey." Last year, another friend, Vickie Lovellette, a former elementary school teacher in Litchfield, gave us a few new Pete the Cat books, including Rockin' in My School Shoes, The Magic Sunglasses and My Four Groovy Buttons. Grace giggles when you read all of them, but one of my favorites has become The Magic Sunglasses. This time, Pete is having a bad day, and feeling blue, when Grumpy Toad gives him a pair of magic sunglasses that help him see things in a whole new way. He goes about sharing his good fortune and his new magic glasses with his friends, who also see things in a better light. By the end of the story, Pete is saddened when his new magic sunglasses break. He's not sure what he will do, until he realizes that the good mood has been inside him the whole time. How many times could my day have been better if I chose a positive outlook on the situation? Probably more than I care to admit. But Pete the Cat provides a good reminder to always look on the bright side, because as Pete would say, "it's all good." I'm looking forward to sharing other life lessons Grace and I have read about in the coming year. We love reading together, and we hope our stories inspire you too!